28 Oct10 Computarium member Jean Mootz donated today a splendid Canola SX-300 computer/calculator, which was in heavy use by the students of the LCD in the 1970's. It is probably from 1973. The computer is in mint condition and works like new! 26 Oct 10 The conference on ZUSE by Prof. Asselborn was a great success, with an audience of about 20 (which is really fair here at Diekirch). The conference was especially attractive, and Jean-Claude Asselborn had added for this occasion a couple of slides explaining the calculation of the square root by Töpler's and by the traditional method (both in decimal and binary). The Computarium is very happy to welcome Jean-Claude Asselborn as a new team-member.! 20 Oct 10 Our member Carole Hientgen has become the happy mother of young baby girl Neele. Our best wishes to the family and especially to little Neele, who surely will soon rival her mother in Napier Bones skills! 19 Oct 10 The conference on Konrad ZUSE by Prof. Asselborn will be repeated at the Lycée Classique de Diekirch, the 26th October 2010 at 19:00. Entrance is free. See here. 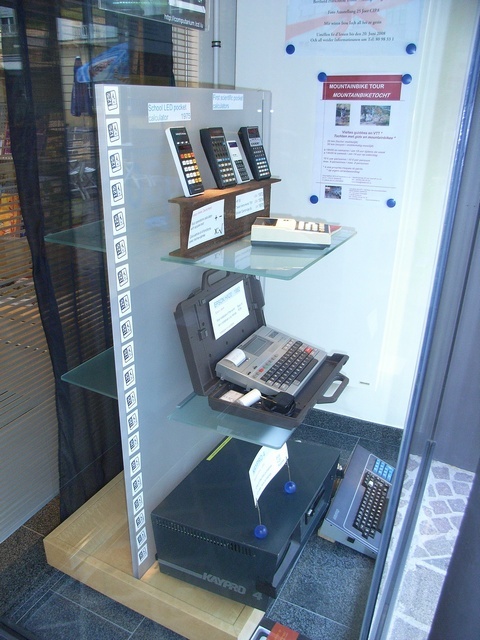 13 Oct 10 M. Nic Malget, a former student of the LCD (promotion 1972) donated a Motorola Exorset30 system (1980), a Apple IIe (1983) with a huge collection of software and a French MAZEL II development board (1979) based on the Motorola 6800 processor. After some fiddling, the Motorola system is running now and boots into XDOS and BASICM. 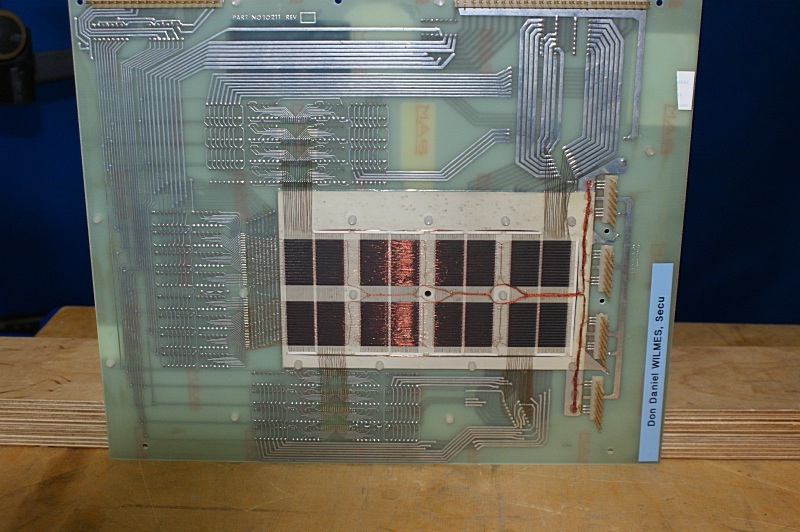 The Mazel board also runs fine. Many thanks! J-Cl. Asselborn is one of the main instigators to create the Computarium.. Click here for more details! 24 Sep 10 The Computarium participated with 10 members to the Researchers Night, a big and splendidly organized happening around the topic of research. 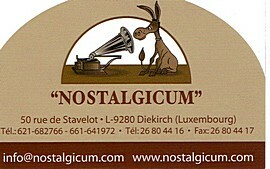 This a pan-European organization that was realized here in Luxembourg by the FNR. It was a big success, and we were happy, albeit a bit rough on the voice after guiding during 7 hours ca. 250 visitors through our 4 workshops. More here. 2. I added a section "HISTORIC_CALCULATING to the LITERATURE chapter with many articles on Toepler's algorithm to compute the square-root. Among these an outstanding contribution by Computarium member Claude Baumann. 10 I finished today the rewriting/update/editing of sections 3 to 5 of the virtual museum. All sections now have a uniform format, what makes future changes much easier. 10 Jul 10 The Computarium received today a truly exceptional donation: an IMSAI 8080 microcomputer, probably built in 1975 (only ~17000 were built before IMSAI went bankrupt). 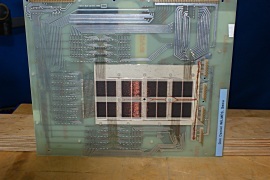 Curiously the S-100 bus machine is labeled "Z-100 microcomputer system", but it is a genuine IMSAI 8080 (as shown on the MPU board) and not a variant of the much later built Heathkit Z-100 system. You may visit this shop during your next stay at Diekirch! 10 M. Daniel WILMES from the Computing Dept. 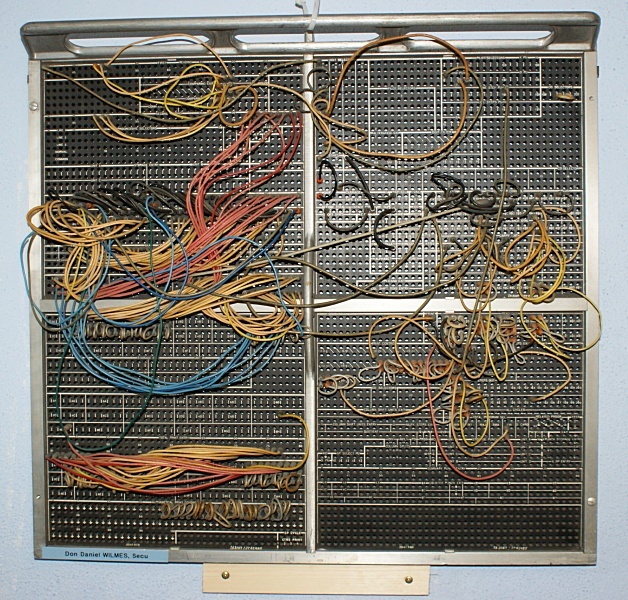 of the Social Security Administration donated a vintage IBM 29/59 card puncher and verifier, two IBM plug boards and a Logabax 8k core memory board. With the help of Angelo Dimola and Serge Huet from the technical staff of the LCD this heavy material was moved from Luxembourg to the Computarium..
19 Jun 10 The Computarium held 3 small workshops and made guided tours duruing the Journée des Anciens of the LCD. 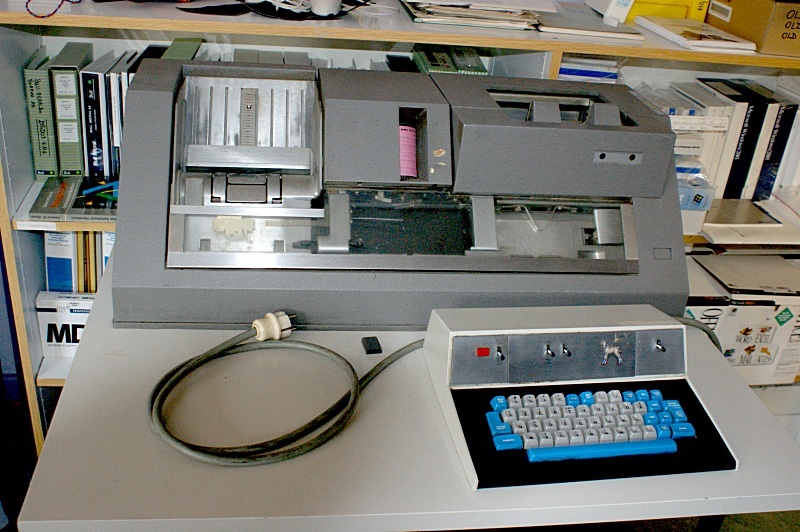 15 Jun 10 M. Christian Bechoux donated a marvellous HP7585B A0 plotter to the Computarium. 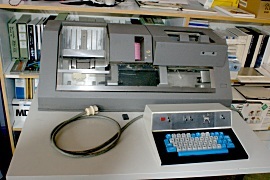 The plotter is in mint condition. Getting the device into the car for transportation was a bit arduous, many thanks to M. Bechoux and to J-Cl. Krack for helping out. 10 1. 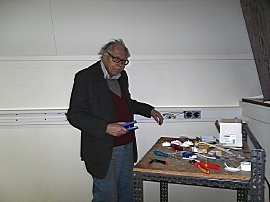 M. Eric Dondelinger, an ETHZ engineer, donated a lot of very interesting equipment today. Please look at the "contributors" page for details. Many thanks! 27 Apr 10 The Computarium showcase will be augmented by "Tales of Things" QR-codes. 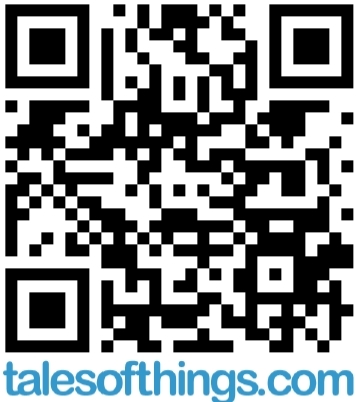 These allow to access further information of the exposed item by scanning the code with a phone (iphone or android) running the free "talesofthings" applet. More info here. We will start a test with a QR-code for the Curta machine. Try it out! 10 C. Heirendt and F. Massen drive to Paderborn to visit the Heinz Nixdorf MuseumsForum, the greatest museum of vintage computers and calculating machinery of the world. See here. 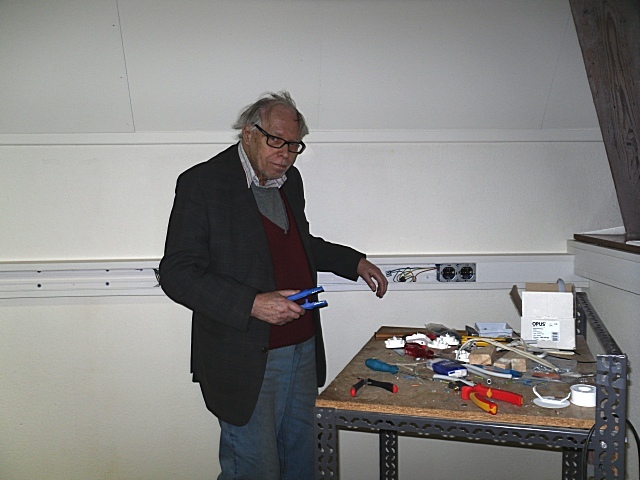 Hard work on the TC (Thesaurus Computarii, the attic) is mostly finished: here you see Jean Mootz wiring the last socket the 25th March 2010 (click on picture to enlarge). Final (somewhat exhausting) paint job was made a couple of weeks ago with the helping hands of J-Cl. Krack and Marcel Kramer. Prior to that, lightning was installed in one long evening with Cl. Baumann. Well over 800 hours of work have been made since Aug.2009. Next step: ordering and installing the cabinets and miscellaneous shelves. 30 Oct 09 The work on the TC at the attic progresses as planned. The first room, holding the bureau, repair-shop and a first vitrine is practically finished. The much larger room 2 is still in the works: the most important repairs (especially on the windows) have been done. We moved most of our items to a temporary room, close to the definitive TC. I think that for the moment about 500 working hours have been invested in the TC up to today. Look at an album here; you will see a picture of room #1, the LED lightings we are installing in the old vitrine and which make a very nice effect, a window before and after repair, Jean-Claude Krack and my-self installing the blue temporary shelves and some more. Great news: The Computarium received a grant from the FNR (Fonds National de la Recherche) to transform a part of the run-down attic of the LCD into a definitive warehouse. Actually we plan to to make this a blend of stock and exhibition rooms. The name is Thesaurus Computarii (TC for short). Three of us (Baumann, Krack, Massen) started work on the first room. Short album here! The crew is happy to welcome 3 new members: Anouk NEVEN and Julien MEYER who are students in mathematics at the University of Brussels (ULB), and Louis WILMES, an ex-LCD student and a research physicist at ArcelorMittal. 16 May 09 Computarium was present for one day at the "Semaine de la Créativité et de l'Innovation" organized by Luxinnovation at the Kirchberg exposition halls. Click here for more! 24 Apr 09 Official inauguration of the "Computarium" exhibition landscape: this is a really outstanding piece of showcases designed by architects Hermann & Valentiny and Partners and installed at the 2nd floor of the LCD. The picture shows in the first front from left to right: F. Massen, M. Schank (MoP), C. Wiseler (minister of Public Works), A. Kaes (MoP), F. Thillen (LCD), J. Bonert (town council Diekirch), M. Delvaux-Stehres (minister of Education). 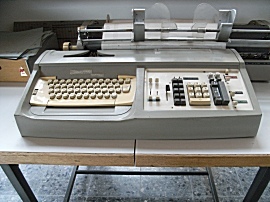 19 Feb 09 The Computarium received a valuable gift: a vintage KIENZLE 600 (German made) booking machine from 1961. 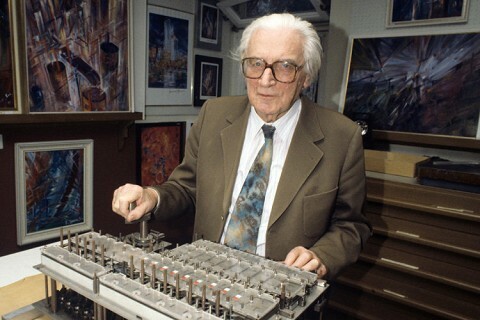 The gift is made by the Lycée Technique Hôtelier Alexis Heck (LTHAH) and former user and bookkeeper Norbert Rischartz. The machine seems to be in a very good shape. Many thanks! 18 Feb 09 A group of 6 students of the mathematical faculty of the ULB (University Libre de Bruxelles) was on a visit. They are preparing a boot on historic calculators for an exposition " Evolution/Revolution". They will show vintage mechanical calculators and several of the most antique electronic pocket calculators from our collection. The groupe is guided by Anouk Neven, a former student of the LCD. 31 Dec 08 I added a lot of mechanical and electromechanical devices to the Virtual Computarium. Section 1 now contains over 160 items. All slides have an identical layout, all pictures have been replaced by new ones or bettered resolution. Please tell me about any errors you may find. A Happy New Year 2009 to all visitors, friends, sponsors and collaborators of the Computarium! 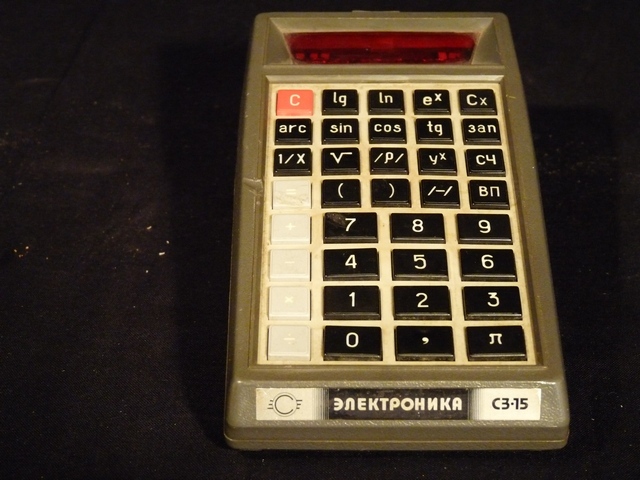 17 Dec 08 I got from an eBay bid a working specimen of the first Soviet scientific calculator, the Elekronika C3-15. 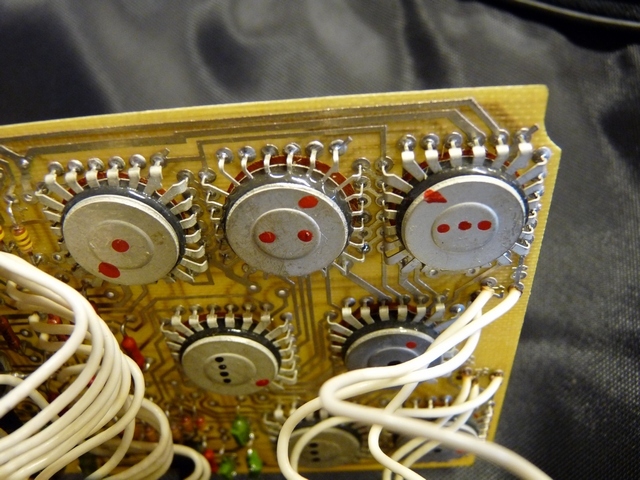 Look here and here (this picture shows the very strange packaging of old Russian IC's)! 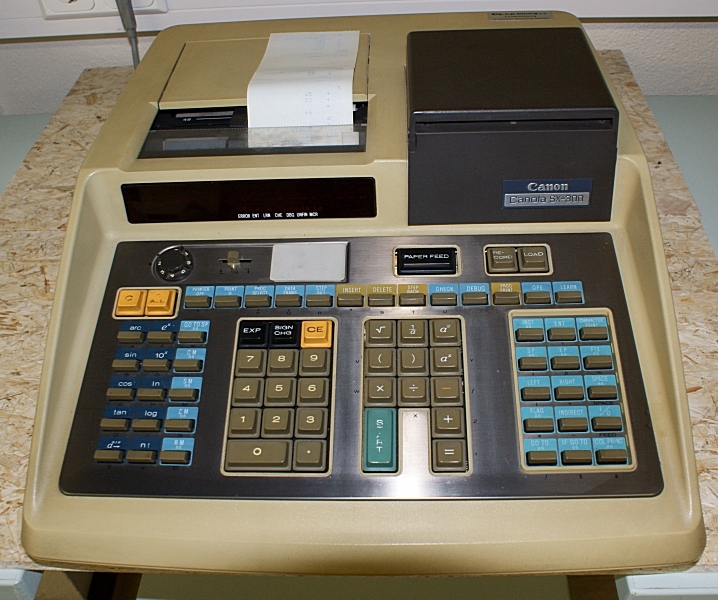 Click here to visit the very interesting Museum of Soviet Calculators. 20 Nov 08 Mr. Norbert Friob, president of the group FNP, donated today a very large set of 16 items from his personal collection to the Computarium. 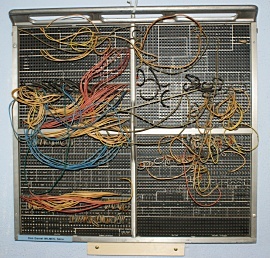 The set holds 5 Facit mechanical calculators, a Precisa printing adder, Diehl and Marchant 4 operations calculators, a smoothly working Comptometer type M., a Olympia 6510 electronic booking machine with an IBM-type spherical printhead, a very old mechanical addressing machine from Sterling Elliott Co., one of the first electronic printing calculators of Burroughs (C2000-C) and 4 more recent electronic printing calculators by Olympia, AEG, Diehl and Casio. Mr. Friob is a very interesting businessman, a real self-made man at the best. Look here for a short CV. Many thanks from the Computarium crew! 30 Oct 08 I added on page 2 a chapter with photo-albums. These albums contain pictures of our machines taken different artists. The first is an album with the pictures taken by Martin Linster for the Letzebuerger Land. 10 Oct 08 The journalist Peter Feist of the weekly journal Letzebuerger Land and his photographer were in Diekirch to take a lot of shots of several (mostly mechanical ) calculators. These pictures will be used to illustrate a special upcoming edition on technology and research. 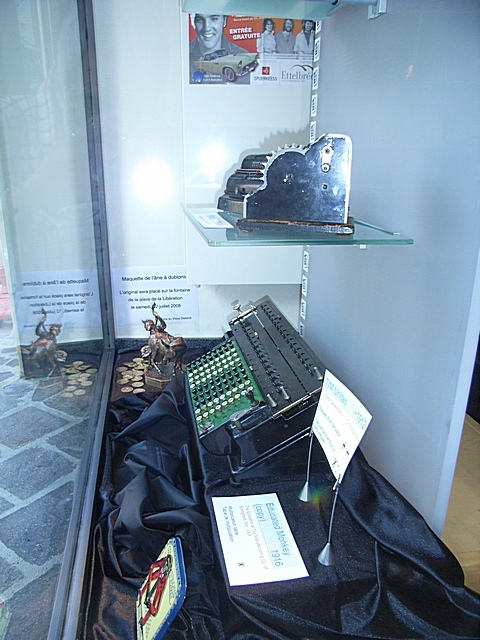 27 Sep 08 Gaul Roland from the National Museum of Military History in Diekirch donated a very rare special computer to the Computarium: it is a vintage calculator used by the Luxembourg Army for artillery calculations. 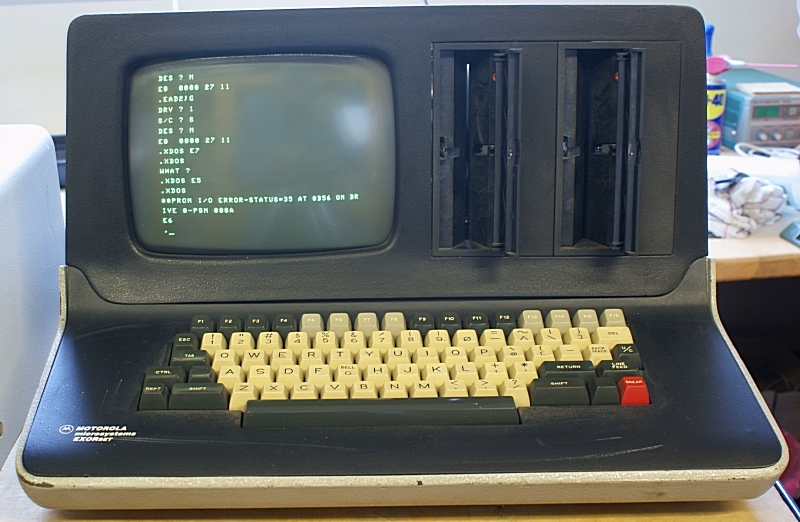 Only 3 of these custom designed computers were built by the former IST (Institut Supérieur de Technologie), now a part of the University of Luxembourg. 10 Jun 08 I am preparing a small exhibition for the Syndicat d'Initiative of the town of Diekirch (www.diekirch.lu). We will show some mechanical calculators and a couple of electronic material. 09 Jun 08 Another bad news: The financial contribution asked from the Fond National de la Recherche (www.fnr.lu) was flatly refused. Apparently we need the help from a museum-specialist. The problem is, when we ask for such a specialist help, the payments asked for may well eat up the whole potential subsidy. 08 Jun 08 1. We have many bad news: the two locations where we planned to establish our museum have both been refused by the Administration of Public Buildings and it's minister. We can not use the vast spaces of the attic (3rd floor) because there is no money left to make the necessary transformations, and because it has become a general policy not to allow occupation of such type of places. The alternative (at zero cost) was to use school-room containers that will become redundant in September. This was refused on "esthetic" grounds: the containers will be demolished to make room for some parking places. 2. Everything is not lost: the Minister Claude Wiseler himself suggested that his administration would build ( and finance) the necessary facilities to make a permanent exposition in one or two of our large halls. We will not have room enough to show the whole collection, so we must make a careful planning and possibly some rotation with the shown objects..
30 Mar 08 The new version 3 of our virtual museum is now finished. It holds about 90% of our collection, and has been divided into 5 sections for ease of use. 26 Nov 07 Added the new part 1 with more than 100 mechanical and electromechanical devices to the virtual museum version 3. 24 Sep 07 Ouff!! The Cirque des Sciences has closed. We had a huge success with our workshop "Calculs à l'ancienne" (Vintage calculus), and were sometimes close to exhaustion. The Napier Bones ( and the kit) was an outstanding success, as was the teaching of Abacus computing and the clanking printing adders. Big thanks to all the people working hard to make this happen. See here for an preliminary album and here for definitive album. - Received yesterday an old NCR cash-register and a Burroughs mechanical printing calculator (nine 10 keys rows). Repaired Burroughs today. 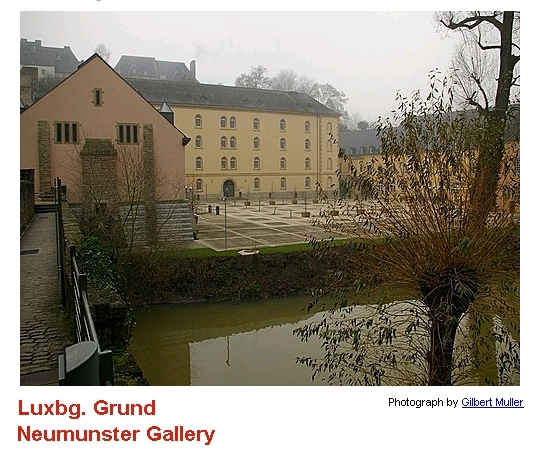 02 Feb 07 http://computarium.lcd.lu is online; all new information around the planned museum will be found here! The collection now holds over 250 items (mechanical and electro-mechanical calculators, slide-rules, mini-computers, microcomputers, handheld calculators...) going back up to 1928. It is the largest collection of vintage computing machinery of Luxembourg.